In 2004 Ford Mustang celebrates its 40th anniversary. As a two-seater prototype, the Mustang already existed in 1962, when it warmed the crowd at the Grand Prix of Watkins Glen with a V4 mid-engine from Germany. This Mustang I however, was not suitable for production. The car looked too futuristic and Ford management wanted a four-seater. This would sell better with young families. For comparison, Ford took the Corvette and knew they had to do better than that with a more versatile car. The Mustang II from 1962/1963 came closer to the definite design by Joe Oros. Eventually, Ford management gave permission to start producing his design, which featured the galloping horse in the nose of the car. This running horse in corral was designed by Phil Clark, a young Ford designer. At first, the car was named after the Lockheed P51 (Mustang) fighter, but Henry Ford II didn’t want a “war image”, so they opted for prairies and wild American horses. De car was first shown at the world fair in New York on April 17, 1964. 2500 newspapers had already received information about the car, and the Ford marketing machine was working like never before. How did the idea about the Mustang get started? From the early days on, there was a strong rivalry between the Ford Motor Company and the Chevrolet division of General Motors. Both brands served the same market. Chevrolet had launched the Corvair because there was a need for compact and low fuel consuming cars. Ford responded with the Falcon and this car sold much better than the Corvair, just as the Thunderbird had done in the fifties with the Corvette. Next, Chevrolet presented the Corvair Monza, This was a sporty compact car which was high on demand. Ford tried to compete with the Falcon Futura, but the Corvair Monza sold much better because the Falcon lacked the image and character of its competitor. To beat Chevrolet, Ford needed a new car. A car with sporty looks and sporty performance; a car that appealed to a young audience. Ford president Lee Iacocca had cleverly researched that the post-war Baby Boom generation in 1964 reached the age where they would want to own a car like this. Furthermore, the number of young people turned out to be enormous, so he knew that an appealing product for this group could become a huge success. Iacocca turned out to be right. In April 1964 the Mustang presented itself on the market. Production numbers were too low to serve a demanding market. People gathered at Ford dealerships. Iacocca said: “If on April 17, 1964 Martians would have landed in downtown New York, no one would have noticed because everybody was at a Ford dealership.” That very first day, 22000 cars were ordered and within the next four months, 100000 were sold. The Mustang truly was different; that’s why this Ford was called “Pony Car”. It wasn’t restricted to status or class. It appealed to almost everybody. So, a poor man’s Ferrari…. At first, the Mustang came as a convertible or hardtop coupe. In 1965 a sporty fastback was introduced. The early Mustangs had long fronts and short backsides. The interior was also sporty with bucket seats in the front and a small bench in the back. It had a deep, disk-like steering wheel and a horizontal speedometer with resembled the one in the Falcon. Another option was air conditioning, which was installed in the center of the dashboard. Triple taillights on both sides would become a feature for many years to come. The Mustang standard price was $ 2368, but there were plenty of options, like different interior designs and accessories, to create a personalized racer, that would cost more than double the standard price. Ford noticed that the long options list was a new marketing hit, and sold very well. 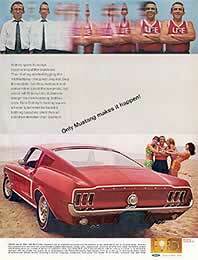 The first year, 418000 Mustangs were sold and in 1966 sales reached one million. The Mustang had arrived, and was here to stay !!! 1965 brought several changes for the Mustang. Most important was the introduction of the fastback model. Furthermore, Ford introduced the GT model in April 1965. Production in this year reached more than 500000 cars. Most changes in 1966 were cosmetic changes. The choice of interior colors and interior styles rose to 34 possibilities, so the buyer had even more ways to personalize “his” Mustang. Mustang was also successful on the tracks, and his sporty image was enhanced by the introduction of the Shelbt GT-350 in 1965 and (later) the Mach 1. The Mustang was coming of age. In 1969 it became larger and heavier. De new Mustangs were almost 4 inches longer. Other models were de Grande, the Mach 1, the Boss 302 and the Boss 429. The Grande was based on the hardtop. This model emphasized luxury, but interior as exterior. The Mach 1, on the other hand, emphasized performance with details borrowed from racing. It also had a luxurious interior and was fitted with a mat black hood with aggressive looking shaker and conspicuous striping. The very exclusive Boss 302 was produced so Ford could enter this car in Trans-Am racing. Trans-Am regulations stated that Ford had to sell 1000 cars to the public before it could compete in races. The same rule applied to the Boss 429, which entered NASCAR (National Association for Stock Car Automobile Racing). At this point, the beginning of the end came close because new environmental legislation tamed the Pony and it started to appear middle-aged, just like the T-bird ! Special editions were built for certain parts of the United States, such as the “Twister Special”. This was sold exclusively in the area around Kansas City. This Mustang, based on the Mach 1, had Grabber Orange paint and special logos. Due to the oil crisis and import of smaller, more economical cars from Europe and Japan, by the end of 1973 the Musclecar era ended. From 1974 through 1978 Ford built a smaller Mustang, with smaller engines and less power. Since a few years, people start to notice the Mustang II again, although parts are very hard to come by. Interesting detail in 1967 was the “Exterior Decor Group”; the hood with twee air vents, pointing backward. This 1967 edition was longer and the front was more open, so the car looked a lot more aggressive. In 1968 a special model was built, the GT/CS California Special. 1967 and 1968 Mustangs all got new dashboards with two large meters and three smaller ones on top. In 1979, under the supervision of Phil Caldwell, Ford introduced the third generation Mustang, with very slick design. Through several facelifts, this third model evaluated up until 1993. By the end of the eighties economy was bad, and Ford was planning to stop producing the Mustang. Sales were down and Ford had to lay off people. Eventually, the Mustang was saved due to hundreds of thousands protests from Mustang fans all over the world. Ford allowed a small group of enthusiasts, with a very small budget, to start producing a Mustang for the nineties, the Mustang 4. “Team Mustang” did a very good job and with lots of passion a car was created that captured the greatness of the sixties. This Mustang was put on the market in 1993 and appeared to be a step in the right direction. The horse returned at the front of the car, and it was selling well immediately. Now, Mustang is the best-selling muscle car, showing its taillights to Corvette, Camaro and Firebird. In 1999 Ford changed generation four slightly and power was increased again. The future of the Mustang is already presented with the powerful looking new 2005 model, which will be built in the brand new Auto Alliance International assembly plant in Flat Rock, Michigan. Whatever happens next…..Mustang has earned his place in history and is a concrete part of automotive history.